SALE PRICE REFLECTS FINANCING WITH VOLKSWAGEN CREDIT*, SEE DEALER FOR DETAILS. *Dealer Choice Two New Arrival! *Navigation* *Bluetooth* *All Wheel Drive* *Sunroof/Moonroof* This 2019 Volkswagen Atlas 3.6L V6 SEL Premium is Fortana Red. This Volkswagen Atlas 3.6L V6 SEL Premium comes with great features including: Navigation System, Bluetooth, Leather Seats, Sunroof / Moonroof, Satellite Radio, Panoramic Sunroof, All Wheel Drive, Rain Sensing Wipers, Keyless Entry, and Tire Pressure Monitors . Buy with confidence knowing Scott Volkswagen has been exceeding customer expectations for many years and will always provide customers with a great value! SALE PRICE REFLECTS FINANCING WITH VOLKSWAGEN CREDIT*, SEE DEALER FOR DETAILS. *Dealer Choice Two This 2019 Volkswagen Atlas 3.6L V6 SEL Premium will sell fast! All Wheel Drive. This Atlas has many valuable options! Leather seats. Navigation. Bluetooth Connectivity. Sunroof. Panoramic Sunroof. Satellite radio. Aux. Audio Input. -Auto Climate Control -Fog Lights -Security System -Garage Door Opener -Keyless Entry -Rain Sensing Wipers -Steering Wheel Controls -Towing Package -Leather Steering Wheel -Automatic Transmission On top of that, it has many safety features! -Traction Control Save money at the pump, knowing this Volkswagen Atlas gets 23/17 MPG! Call Scott Volkswagen at (855) 611-7323 to confirm availability and schedule a no-obligation test drive! We are located at 777 Taunton Ave, East Providence, RI 02914. SALE PRICE REFLECTS FINANCING WITH VOLKSWAGEN CREDIT*, SEE DEALER FOR DETAILS. *Dealer Choice Two New Arrival! *Navigation* *Bluetooth* *All Wheel Drive* *Sunroof/Moonroof* This 2019 Volkswagen Atlas 3.6L V6 SEL is Fortana Red. 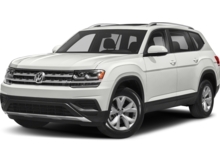 This Volkswagen Atlas 3.6L V6 SEL comes with great features including: Navigation System, Bluetooth, Sunroof / Moonroof, Satellite Radio, Panoramic Sunroof, All Wheel Drive, Parking Sensors, Rain Sensing Wipers, Keyless Entry, and Tire Pressure Monitors . Buy with confidence knowing Scott Volkswagen has been exceeding customer expectations for many years and will always provide customers with a great value! SALE PRICE REFLECTS FINANCING WITH VOLKSWAGEN CREDIT, DEALER CHOICE TWO, SEE DEALER FOR DETAILS. New Arrival! This 2019 Volkswagen Atlas 3.6L V6 SE w/Technology R-Line will sell fast! All Wheel Drive. This Atlas has many valuable options! Bluetooth Connectivity. Satellite radio. Aux. Audio Input. -Auto Climate Control -Fog Lights -Security System -Keyless Entry -Rain Sensing Wipers -Steering Wheel Controls -Towing Package -Leather Steering Wheel -Automatic Transmission On top of that, it has many safety features! -Traction Control Save money at the pump, knowing this Volkswagen Atlas gets 23/17 MPG! Call Scott Volkswagen at (855) 611-7323 to confirm availability and schedule a no-obligation test drive! We are located at 777 Taunton Ave, East Providence, RI 02914. Take advantage of tremondous savings with this former Dealer Demo! AWD, -Priced below the market average!- Navigation, Back-up Camera, Bluetooth, This 2018 Volkswagen Atlas 3.6L V6 SEL Premium, has a great Deep Black Pearl exterior, and a clean Titan Black interior! Heated Seats, Auto Climate Control, Leather Steering Wheel Satellite Radio, Steering Wheel Controls, Sunroof/Moonroof, Seating, AM/FM Radio Rain Sensing Wipers Park Distance Control ABS Brakes Satellite Radio Call to confirm availability and schedule a no-obligation test drive! We are located at 777 Taunton Ave, East Providence, RI 02914. SALE PRICE REFLECTS FINANCING WITH VOLKSWAGEN CREDIT*, SEE DEALER FOR DETAILS. *Dealer Choice Two New Arrival! *Bluetooth* *All Wheel Drive* This 2019 Volkswagen Atlas 3.6L V6 SE w/Technology is Platinum Gray Metallic. 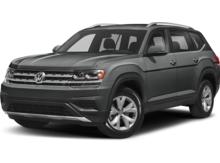 This Volkswagen Atlas 3.6L V6 SE w/Technology comes with great features including: Bluetooth, Satellite Radio, All Wheel Drive, Rain Sensing Wipers, Keyless Entry, Tire Pressure Monitors, and Towing Package . Buy with confidence knowing Scott Volkswagen has been exceeding customer expectations for many years and will always provide customers with a great value! SALE PRICE REFLECTS FINANCING WITH VOLKSWAGEN CREDIT, DEALER CHOICE TWO, SEE DEALER FOR DETAILS. SALE PRICE REFLECTS FINANCING WITH VOLKSWAGEN CREDIT*, SEE DEALER FOR DETAILS. *Dealer Choice Two *All Wheel Drive* This 2019 Volkswagen Atlas 3.6L V6 SE is Reflex Silver Metallic with a Titan Black interior. 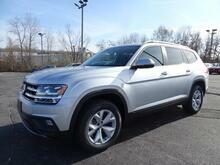 This Volkswagen Atlas 3.6L V6 SE comes with great features including: All Wheel Drive, and Towing Package . Buy with confidence knowing Scott Volkswagen has been exceeding customer expectations for many years and will always provide customers with a great value! SALE PRICE REFLECTS FINANCING WITH VOLKSWAGEN CREDIT*, SEE DEALER FOR DETAILS. *Dealer Choice Two *Navigation* *Bluetooth* *All Wheel Drive* *Sunroof/Moonroof* This 2019 Volkswagen Tiguan SEL Premium is White Silver. This Volkswagen Tiguan SEL Premium comes with great features including: Navigation System, Bluetooth, Leather Seats, Sunroof / Moonroof, Satellite Radio, Panoramic Sunroof, All Wheel Drive, Parking Sensors, Rain Sensing Wipers, and Keyless Entry . Buy with confidence knowing Scott Volkswagen has been exceeding customer expectations for many years and will always provide customers with a great value! SALE PRICE REFLECTS FINANCING WITH VOLKSWAGEN CREDIT*, SEE DEALER FOR DETAILS. *Dealer Choice Two This 2019 Volkswagen Tiguan SEL Premium will sell fast! All Wheel Drive. This Tiguan has many valuable options! Leather seats. Navigation. Bluetooth Connectivity. Sunroof. Panoramic Sunroof. Satellite radio. Aux. Audio Input. -Auto Climate Control -Fog Lights -Security System -Parking Sensors -Keyless Entry -Rain Sensing Wipers -Steering Wheel Controls -Leather Steering Wheel -Automatic Transmission On top of that, it has many safety features! 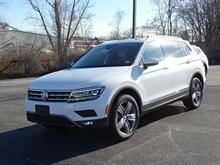 -Traction Control Save money at the pump, knowing this Volkswagen Tiguan gets 29/21 MPG! Call Scott Volkswagen at (855) 611-7323 to confirm availability and schedule a no-obligation test drive! We are located at 777 Taunton Ave, East Providence, RI 02914.